My First try at Braising, Osso Buco Style! The progression of a person’s cooking style is an interesting thing. When I was little, my mom used a pressure cooker, a lot. It was the perfect way for a working mother to be able to cook an amazing hot meal that seemed like it would have cooked all day. Because of that, my early experiences with cooking all involved pressure cookers. That’s right, I was the 8 year old standing on a stepping stool and peeking over the top of the pressure cooker to make sure my tomato bredie was cooking just right. Dangerous, probably, but a great hobby for a kid! 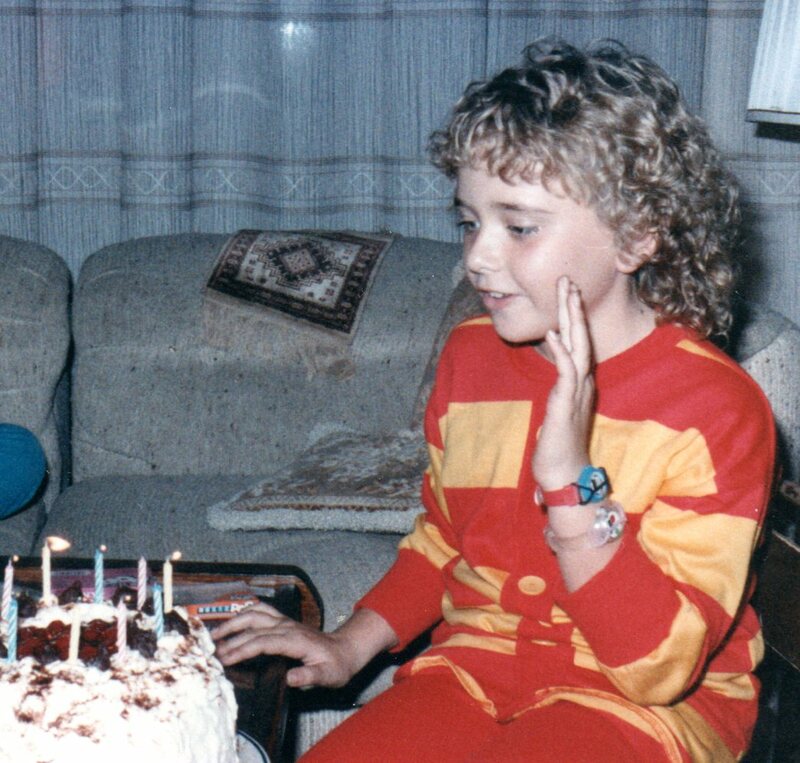 Respect the 80's perm & the double Swatch Watches w/ the face guard! Given the frequent use of the pressure cooker in our house, there was no slow roasting or braising that I can recall. What exactly is braising? Well, it is searing a meat and then cooking it in liquid for an extended period of time to make it extra tender and tasty. With my braising definition in hand, I was on the hunt for a fool-proof recipe that I would not be disappointed in. It was my first time braising after all, it should be special! Then it came to me…in an email from a friend…Saveur Magazine’s 15 Braised Meat Recipes! The Osso Buco was the one, THAT would be my 1st braising recipe. I would, however, use beef instead of veal. I would also like to take a minute to warn you to take the “shank” cut as a shank cut, and NOT look up what that means. I did. I put off making the recipe for a couple of weeks…. But I digress. I picked up a new pan especially for braising, and of course I named her! So everyone, please welcome Eta to the family! Why Eta? Well because she sings to me of course! Since her arrival last week, Eta has produced 4 amazing meals. But this one was truly the most decadent. Honestly, this is a meal I would have paid 5 star restaurant prices for. And it wasn’t even that hard!! You could definitely make this meal at home and completely wow your dinner guests. 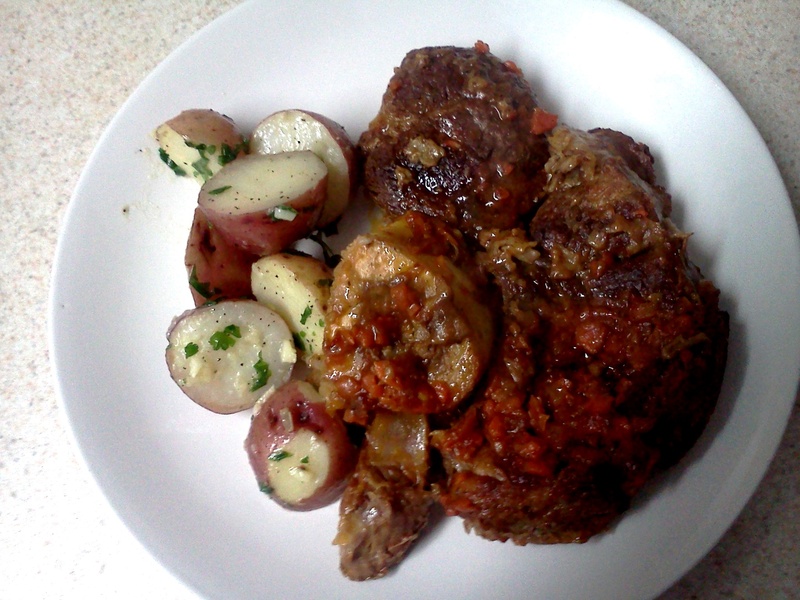 I served the Osso Buco with super easy and delicious garlic parsley new potatoes (that recipe is below as well). I hope you enjoy the recipes as much as we did! Did you enter to win a month’s supply of Popchips yet? What is your favorite “cook to impress” meal? When your side dishes are ready, spoon sauce over the shanks and serve! This entry was posted in Recipes and tagged beef, blog, boston blogger, braised, braising, chardonnay, cooking, dinner, main course, new potatoes, Osso Buco, potatoes, recipe, shanks, side dish by reneeh. Bookmark the permalink. Looks great! Never tried osso bucco, but just had my first braising experience. Great job! That picture of you is priceless. I want to try that potato recipe. This looks fabulous! You (and Eta) did a fabulous job! OOh. I love that you name your kitchen ware too! Was just discussing this with SBK and Boston Food Diary last night, I mentioned my KA whose name is Esther with a whole back story. I think it’s just so much more fun when you give things a character! Welcome, Eta! Osso bucco is so delish, isn’t it? I love braising– makes such tender meat! 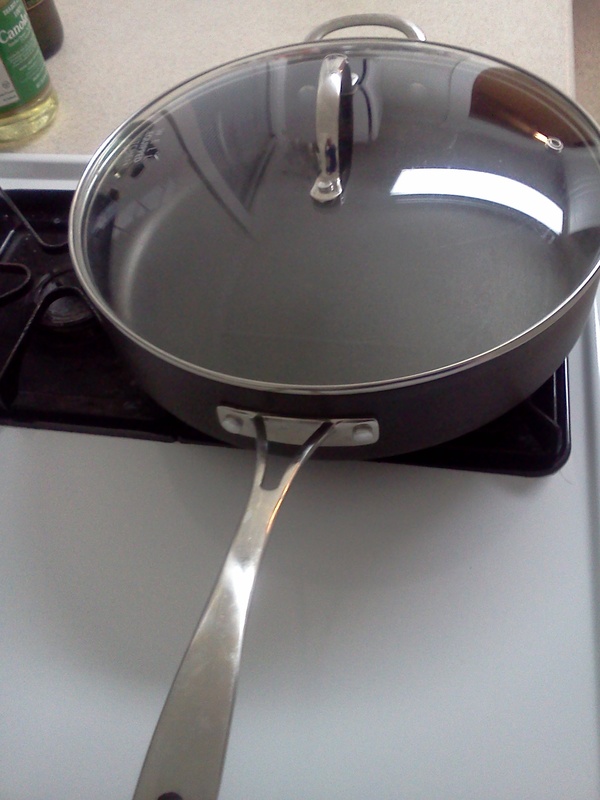 Okay, how much am I loving that you named your new pan? That’s awesome! Thanks so much for linking to Saturday Swap!!! I’m bookmarking your recipe to try soon. What a hearty and delicious meal to warm up my family on a cold winter’s night!! Thanks again for sharing it with us. Have a wonderful weekend…. Spotted you on Saturday Swap! 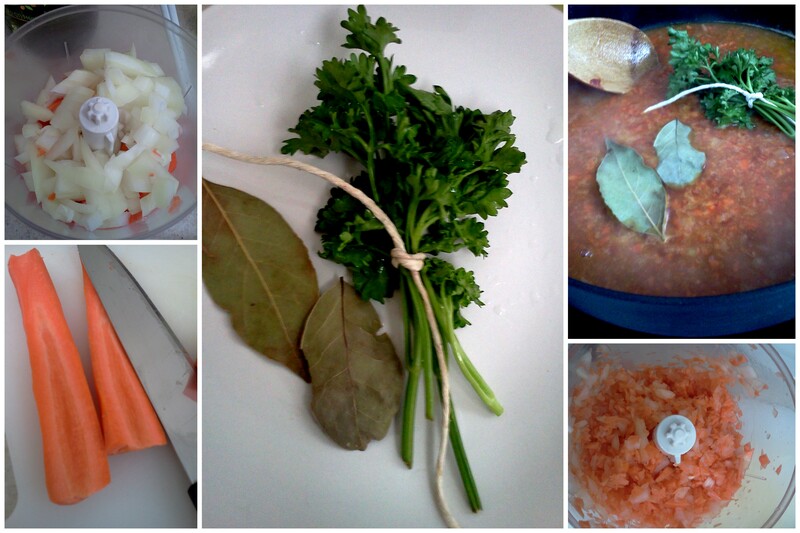 I’ve made Osso Bucco once and loved it – so glad you tried it! And glad you adapted it to beef! Great winter hearty dish! Congrats on your first braise and the new pan! 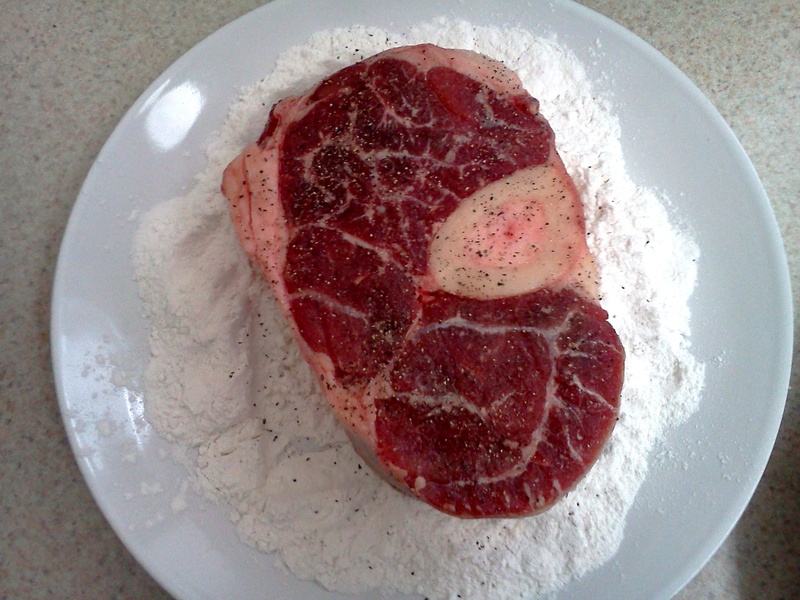 I love osso buco and actually made it for V-day a couple years ago. I’m a huge fan of braising meat…I love the slow-cooked tenderness and the wonderful aromas from braising!